In the summer and fall of 1942, Hitler and the Wehrmachthad the last opportunity to decisively defeat Soviet Russia and win the Second World War. 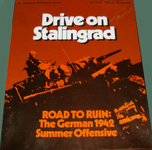 Drive on Stalingrad is SPI's operational level simulation of that most crucial campaign of World War II. The game-system is modeled after SPI's Panzergruppe Guderian game of the 1941 Smolensk offensive, which appeared in S&T57. There is double-impulse movement for mechanized (and cavalry) troops, with combat between the Movement Phases, overruns, and untried units. However, several modifications have been made to reflect the fact that the Red Army, while still not on a par with the Wehrmacht on a unit for unit basis, was a lot more potent a force in 1942 than 1941. Drive on Stalingrad portrays what is in essence an ideal gaming simulation, one Player begins strong and on the offensive, and the balance gradually changes so that, by the end of the game, the German Player must be as aggressive as possible, take as much ground as possible, and destroy as many Soviet formations as possible. The Soviet Player must preserve as many units as possible for use later in the game - often even at the cost of abandoning good defensive positions and victory points.